Masters of the Gridiron Head-To-Head Deck-Building Football Card Game - Sports Mogul, Inc.
"Masters of the Gridiron is certainly worth its weight in gold"
What is Masters of the Gridiron? Masters of the Gridiron is the new head-to-head card game from Sports Mogul Inc., a company with over 15 years designing and publishing sports simulation games. Development of Masters of the Gridiron started 4 years ago, with the goal of creating a realistic football card game that was as addictive and easy-to-learn as our computer games. Our Football Mogul simulation game is currently in its 11th year, giving customers the ability to take control of their favorite team, in any year from 1971 to 2013. We used our experience with this product, and a lifetime of experience as football fans, to write thousands of lines of code that analyzed and evaluated over 1500 real-life players, before narrowing it down to the 832 players that are included in Masters of the Gridiron. 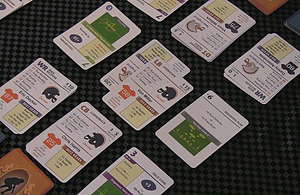 Football Mogul's proprietary play designer was used to create over 400 different Playbook Cards that are included in Masters of the Gridiron. Each team's playbook (included as part of that team's deck) contains both offensive and defensive plays hand-tailored to that team's playing style. However, one of the best features of MotG is that you can build your own team and customize your playbook, combining the most valuable players and the most effective plays from different teams. Easy to learn. Never boring. Game rules fit on one sheet of paper. The average game takes less than 20 minutes. 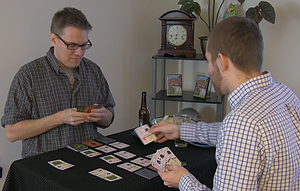 By focussing on the key play in each drive, every card you play affects the final score. Masters of the Gridiron doesn't rely on "play guessing" or rock-paper-scissors mechanics. The offense plays and the defense tries to stop it. It's that simple. Every player on your team matters. If you ignore your offensive line in favor of your "skill" players, you may get stopped on a key drive. Or worse, you could give up a "strip sack" that results in a defensive touchdown. Touchdowns. Field goals. Safeties. Pick sixes. Two-point conversions. MotG has them all, and they all happen with the same frequency as they do in the pros. Years of development have created a game that is both streamlined and strategically deep. Your offensive success depends on the plays you choose and the order in which you play them. On defense, you can try to stop every play, or save your best players for the 4th quarter. Includes everything needed to play a game right out of the box!